With two weeks into the 2009 fall high school and college soccer season, you do not have to look too far in order to spot former Boca players scattered along the sidelines within the high school and college coaching ranks throughout Monmouth and Ocean county as well as across the United States. 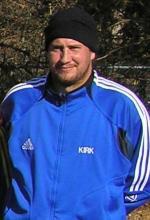 One such Boca alum, Kirk Pericciouli, was appointed the new men’s coach at OCC during the summer. TOMS RIVER, NJ (September 16, 2009) – With two weeks into the 2009 fall high school and college soccer season, you do not have to look too far in order to spot former Jersey Shore Boca players scattered along the sidelines within the high school and college coaching ranks throughout Monmouth and Ocean county as well as across the United States. Several former Jersey Shore Boca standouts are either heading-up or assisting high school or college soccer programs at the Shore this fall while other club alums continue to teach the beautiful game on the national stage. A pair of home-grown Boca standouts Kirk Pericciouli and Sal Colino begin their first year in charge of the Ocean County College men’s soccer program with Pericciouli appointed the new head coach over the summer and Colino as his assistant. Pericciouli, a Bayville resident, played at the University of Wisconsin-Milwaukee during his college playing days and then continued his career professionally with the New Jersey Stallions of the United Soccer Leagues. He is a long-time Boca veteran having been a part of the Boca youth program as well with the Boca men’s open and semi-professional teams. Pericciouli also coached various youth teams within the club including a 4 year stint as a coach of the Boca’s U-13 Super Y-League team. Colino also a part of the Boca men’s and youth programs, performed at Toms River North high school before continuing his career at the University of Tampa. Another pair of Boca alum are together at Toms River East high school with Teddy Gillen (Toms River) heading into his seventh season as head boys coach while Mike Konopka (Toms River) begins his first year in charge of the Raiders girls program. Gillen, a Toms River East graduate, received All-American accolades while at Penn State University during his college career and then continued playing professionally with the NY/NJ Metrostars of Major League Soccer. Konopka, who also played three years for the Raiders soccer program before turning his attention to basketball, was one of the first players from the Shore Conference invited to attend the prestigious Adidas ESP (Elite Soccer Player) program. The Adidas ESP program, which is still active today, identifies the top 150 elite high school age soccer players from across the United States for the possibility of becoming part of the United States National Teams program. Konopka graduated from Stony Brook University in 2004 after starting four years for the Seawolves NCAA Division I basketball program. Both Gillen and Konopka were members of the Boca youth and men’s programs at various times throughout their playing careers. Another new appointment in the Shore coaching ranks this year to come out of the Boca program is Ken Masuhr who has joined the Monmouth University women’s soccer program for 2009 as an assistant coach. Masuhr, who played at Richard Stockton College from 2002 to 2004 after transferring from Rutgers, won two NJAC Championships with the Ospreys. Masuhr, an Ocean Gate resident who palyed at Monsignor Donovan High School before his collegiate career, was a part of various Boca youth and adult teams over the years, including a member of Boca’s U23 team during their inaugural year in the Mid-Atlantic Summer Showcase League (MSSL). The Club is celebrating their 31-year anniversary in 2009.